A printed keepsake from the Illinois House GOP, "Grand Old Party" or Republican, Retreat that was held over a three day period in 1989, January 26th through the 28th. The print shows an elephant, the symbol for the Republican Party, in red and blue with white stars. The text shown states the name of the event as well as the date. This print is covered by light blue and red matting held under glass by a thin silver frame. 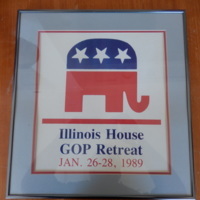 A matted and framed print from the Illinois House GOP Retreat held January 26th through the 28th in 1989. “Illinois House Republican Retreat Print,” UIS History Harvest, accessed April 26, 2019, http://uishistharv1.uis.edu/items/show/95.